Really nice hostel! 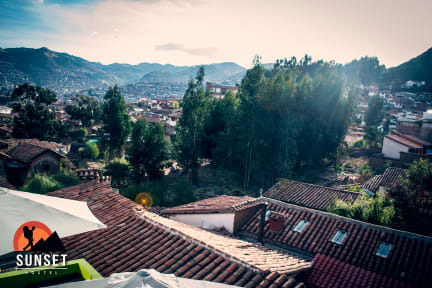 Good view from the rooftop over the valley of cusco. Nice and free living people chilling at different places in the hostel. It's a bit of a climb to get there, but it's worth it! Great place, with lots of different little hang outs including a roof terrace. Breakfast (which is included) with a view :) rooms are nice and clean, people at reception are super helpful and there is a restaurant attached that has a super affordable lunch menu. Would definitely recommend it! I had an amazing time at this hostel. The owners go out of their way to make you feel at home and enjoy your stay as much as a possible. The atsmosphere was really personal and sociable. 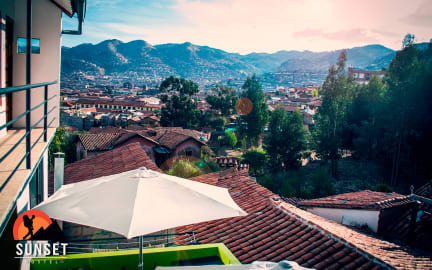 Besides that, it is located in a beautiful area of Cusco, with great views over the city from the rooftop terrace. Would highly recommend! nice hostel, clean rooms and bathrooms, good shower with a big and warm water stream. wonderful rooftop with good brekfast in the sun and a beautiful view. nice staff; very central. Nice staff, very helpful in planning activities. The atmosphere of the hostel is cool; relaxed guests. Rooms are rather basic, but fine for a hostel. It was the best hostel we had during our trip in Peru! We had 3 different hostels in Cusco and this hostel was by far the best!! There was 24h hot water, very friendly staff and good restaurant inside the hostel! The breakfast was simple but for the price you pay for stay is that more enough. Conclusion, we would go back for sure! Had a nice stay. Booked a double room. Only this was a room bunk bed instead of a double bed. The rest was great. Food was nice, staff were nice so recommend! Probably I got a lot of bad luck when I only stayed there for one night. I felt unsave during the night because a man in my dorm got really angry to another guest and woke us all up. In the morning, by mistake a girl had taken my jacket when she went on a tour. And also I found the dorm room is very humid and smelly. The other side is, that the staff is really friendly and they helped me with getting back my jacket.